Kawasaki’s motocross lineup is fairly fresh, so we expected only mild updates for the 2014 KX models. But the Team Green engineers were quite busy in the off-season, cramming in several revisions to the popular KX250F and some milder tweaks to the venerable 450F. The 250F has inherited the Launch Control system that Kawasaki first introduced on the KX450F. It also gets new motor mounts, revised suspension tuning and an upgraded transmission. The Launch Control is the first device of its kind to appear on a 250cc motocrosser. It works by retarding the ignition timing in first and second gears to effectively limit the amount of torque delivered to the rear tire – it’s basically a traction control system at the starting line for dealing with slippery surfaces, such as the concrete pads found at many outdoor tracks. The Launch Control Mode is activated by pushing a button on the left handlebar, while the transmission is stopped in neutral, first or second gear. It works within the first few seconds of releasing the clutch, and shifting into third gear automatically returns the 250F’s ignition timing to a normal map. 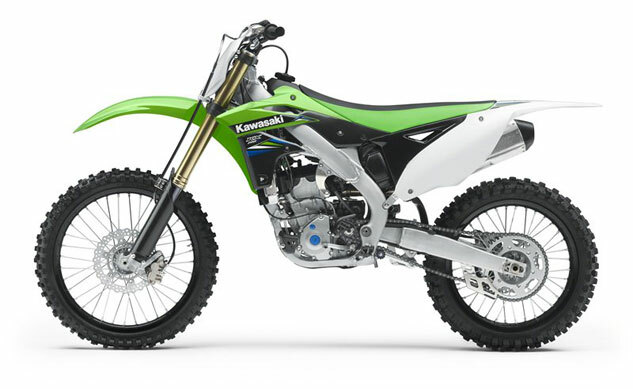 Kawasaki’s KX250F has received more updates than anticipated for 2014. The most notable change is that the 250F now gets the Launch Control system that was pioneered on the 450F. The 250F’s DOHC, 249cc, fuel-injected, liquid-cooled four-stroke Single has also received a significant change in the transmission department via new gears that feature four dogs instead of three to increase smoothness of the 250F’s shifting, while new shift-fork grooves are designed to give the rider better feel at the shift lever. The KX250F’s frame is also largely unchanged except for the change to new high-tensile steel front engine mount plates that are 29% thinner than last year’s steel plates. The new front mount plates are used to change the rigidity balance of the KX’s chassis with enhanced front-end feel and traction being the end goal. Otherwise, the same technology that has kept the KX250F in the hunt for head-of-the-class honors return in 2014, including a Keihin Digital Fuel Injection (DFI®) system with a 43mm throttle body that features dual injector to maximize the high-rpm power and overrev capabilities of the KX250F. The system’s second injector is located upstream of the throttle body and helps build a wider and more potent spread of power at higher rpm. The DFI system also comes with three pre-programmed ignition maps which are easily selectable without requiring a laptop computer or any other electronic device. Maps can quickly be changed between three settings – standard, hard (terrain) and soft (terrain) – by swapping modules. The ECU is also fully re-programmable and custom maps can be created by using the accessory KX FI Calibration Kit, the same tool used by Kawasaki factory and privateer teams in AMA and FIM racing. The KX250F was the first production motocross bike to feature Showa’s Separate Function Fork (SFF), which separates damping and springing duties into the individual fork legs. The fork tubes are a beefy 48mm in diameter, and Kawasaki claims that they contribute to a more planted feel from the front wheel. The KX250F’s Showa shock also has revised settings for 2014. The shock features dual compression adjustability, allowing its high-speed and low-speed damping to be tuned independently. The shock also features a slick Kashima Coating on its piston wall, to help reduce friction and smooth the suspension action. 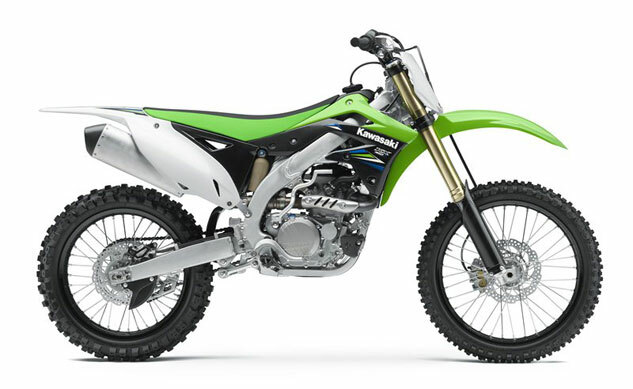 The 2014 KX250F’s appearance is augmented by its white rear fender, silver engine covers and black muffler end cap maintain the factory racer resemblance. Black anodized wheels are part of the overall package, and the factory racer looks are further enhanced by lightweight magnesium clutch, generator and cylinder head covers. The only other changes to the 2014 KX250F involve a switch to new grips that feature shorter barrels and that are made from a softer material to enhance rider comfort, and bold new graphics. The grips and graphics are the only changes to the 2014 KX450F, although all of the basic hardware that three-peat AMA Supercross Champion Ryan Villopoto used this past season is obviously well-proven. Kawasaki’s powerful 449cc, fuel-injected liquid-cooled, DOHC, four-stroke single makes state-of-the-art power for its class, and the 2014 retains the bridged-box-bottom piston to maintain its rigidity at high rpm. For durability’s sake, the 450’s camshaft lobes and tappet surfaces feature a soft-nitride treatment, and an automatic cam chain adjuster means that the cam chain will be kept at the optimum tension. The crankshaft and connecting rod feature also get reliability-enhancing attention in the form of special carburizing and a quenching treatment to maximize their rigidity. The 2014 Kawasaki KX450F carries the same hardware into battle as last year’s bike. The only differences between the two are new handgrips and different graphics treatments. Like the KX250F, the 450F’s ignition timing can be altered to suit track conditions and/or power character via its ECU coupler caps (modules) that provide three preprogrammed maps for standard, hard (terrain) and soft (terrain), without the need for an external programmer or laptop. The KX450F’s front suspension is vastly different than the 250F’s. The 450 uses a 48mm Kayaba Pneumatic Spring Fork (PSF), which uses compressed air instead of coil springs. The reduced weight and inertia of the air spring is said to improve smoothness and enhances the fork’s ability to follow any kind of terrain, specifically high-speed bumps, while the fork’s 32mm diameter internal damping cartridges help provide bottoming resistance. A removable spring pressure adjustment valve and free Kawasaki Genuine PSF Air Fork Pump are included for quick and easy tuning of fork spring pressure. Diamond-Like Carbon (DLC) coating on the outer surface of the inner fork tubes helps to stiction, and a friction-reducing Kashima Coat on the inside of the fork’s outer tubes is also applied to help smooth suspension action, especially at the initial part of the stroke, says Kawasaki. Out back, the KX450F’s Kayaba shock features a 33-position rebound damping adjuster for fine-tuning of the rebound circuit, along with 22-position high-speed and stepless low-speed compression damping adjustability; the high- and low-speed adjustments can be made independently. The shock also gets the Kashima Coat treatment on the piston wall for reduced friction with the goal of smoother suspension action. The 450F comes in Kawasaki Lime Green, with black anodized rims, blue highlights and aggressive graphics inspired by the Team Monster Energy Kawasaki factory race bikes. A blue finish on the oil cap and two caps on the generator cover highlight give them a factory appearance and match the blue anodized finish on the suspension adjusters. Pricing for the 2014 KXFs has yet to be announced. 2019 Kawasaki Z400 Review – First Ride!